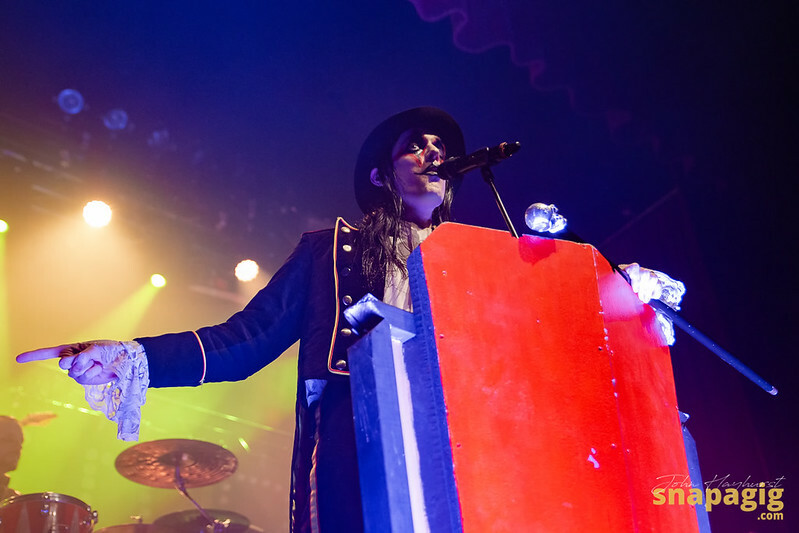 The Freak Circus comes to town and The Ritz in Manchester felt the presence of the King of Avatar Country. 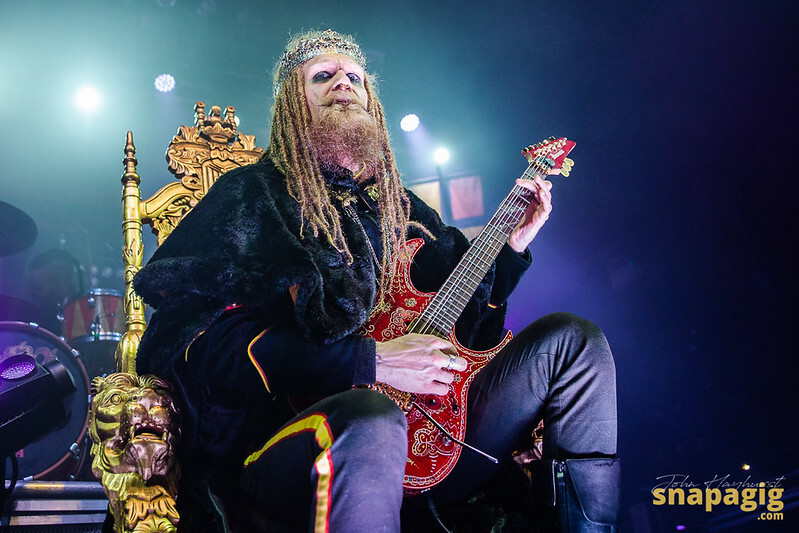 For those that don’t know, the scene for each show is set as a homage to the King of Avatar Country, a land where metal music has saved the day and we should rejoice for our King has come to visit the town to spread the word, so that we can all be future citizens. 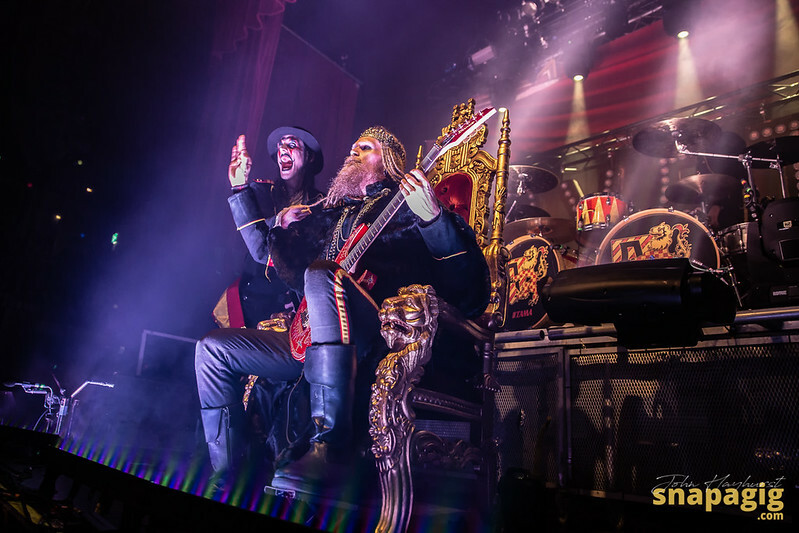 The King himself is guitarist Jonas “Kungen” Jarlsby and at the start of proceedings he is at the very back of the stage on a rising throne which doesn’t quite hit the top of the stage – in a Spinal Tap like moment, the front row cannot really see him other than peering through the drum kit. 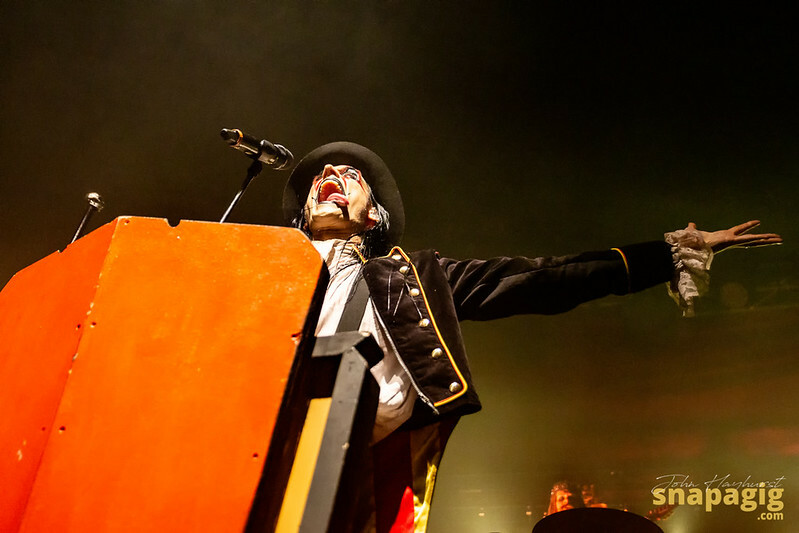 The first track is ‘A Statue of the King’ and lead singer, master of ceremonies, and playing the royal court jester every night Johannes Eckerström stands behind a lectern as if to deliver an important speech to the nation. Eckerström is the main focus here (royalty aside), he has the black and red face paint which can produce mouthy expressions even when he isn’t smiling and his voice alternates between a soft anthemic quality and a growling bear. In equal measure he will entice this crowd into some repeat chorus pantomime and then make your teeth rattle with a gargle of depth felt on the Salford Quay several miles away. He has a hat and cane and a suit with some impressive tails. He occasionally will take the hat off to ensure he can join in with the formation headbanging through ‘Legend of the King’. 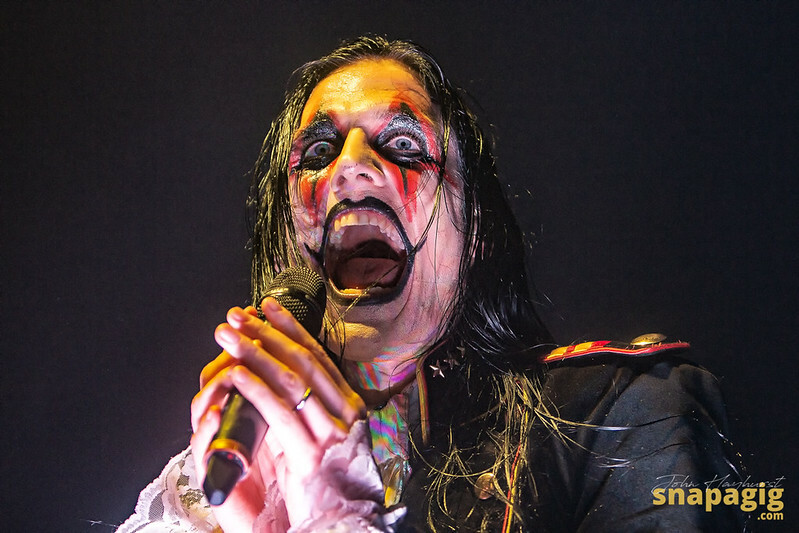 If there was ever a successor to Alice Cooper then it should be this man. 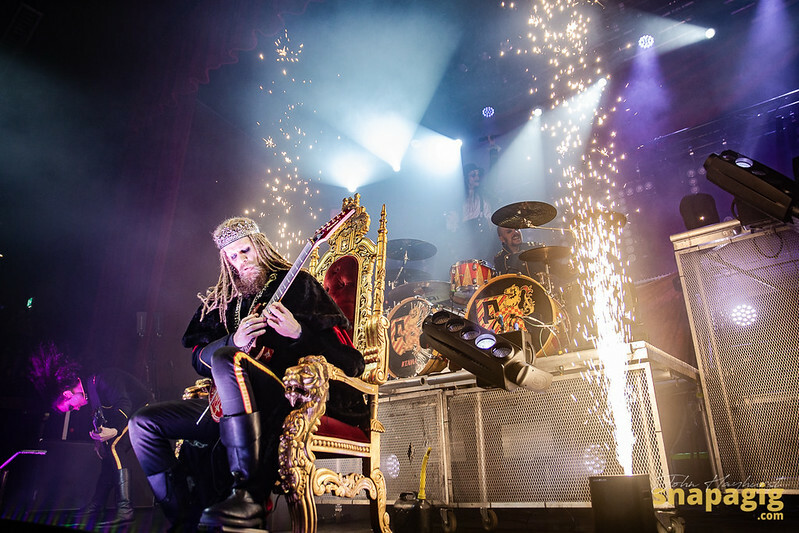 Our King is moved from his throne at the back to another at the very front of stage, still seated he shows everyone how to play some stunning fret runs wearing a crown and cloak, the jester meanwhile moves to the back as the fireworks kick in and shower everyone in sparks. This stage really is not showing off the size that this show can be, and when they do hit the larger venues I expect the full force of a show to be realised. After the theatrics of hailing the King, crowning and placing him on the throne, he removes all this and steps back into the ranks which is Eckerström’s cue to take centre stage for the remainder of the show, and after getting everyone in the room to show him Dio’s devil horns, we get ‘Paint Me Red’ which prompts a couple of crowd surfers as the heat goes up and the sweating can really start. 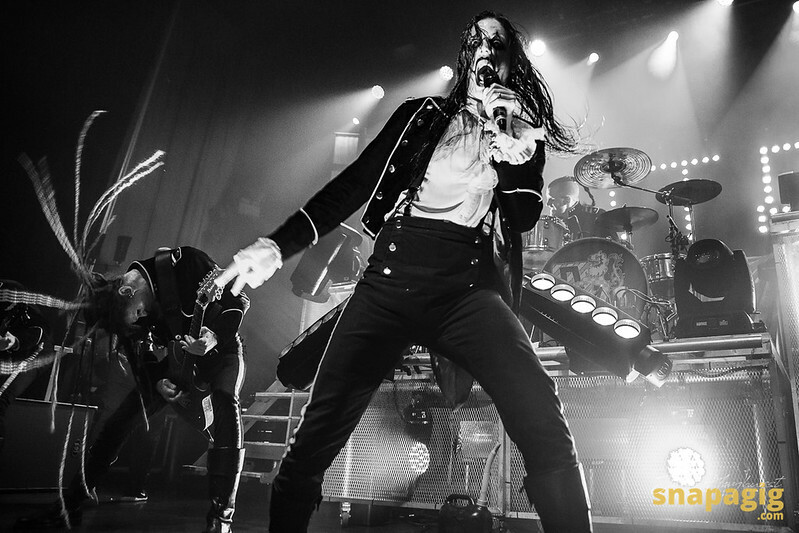 It is a long set, much longer than I saw at Download and sometimes it can feel formulaic, but you can’t deny the visual treat of a band that want to entertain as well as play some crunching heavy metal music. Many in the audience have attempted some facepaint (some better than others) and it was great to see several on the front row matching the windmill of hair coming from all 4 members on the stage (not counting the drummer). 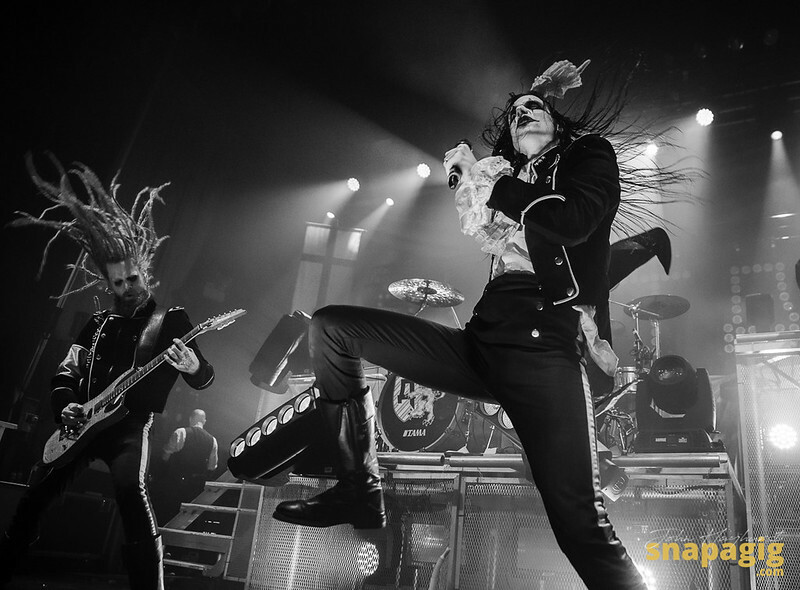 Many artists try a concept album, but they generally fail – far better to completely embrace the concept on stage as well as in the albums, once the facepaint went on, there was no looking back for Avatar, and audiences here will now expect this circus freakshow every night. Only once did the mask slip and you felt Johannes appear, as he explained about the prejudices of appearance to others – encouraging everyone to let their freak flag fly and ignore critics. He then introduced fan favourite ‘Smells Like a Freakshow’ and the crowdsurfing began again in earnest. 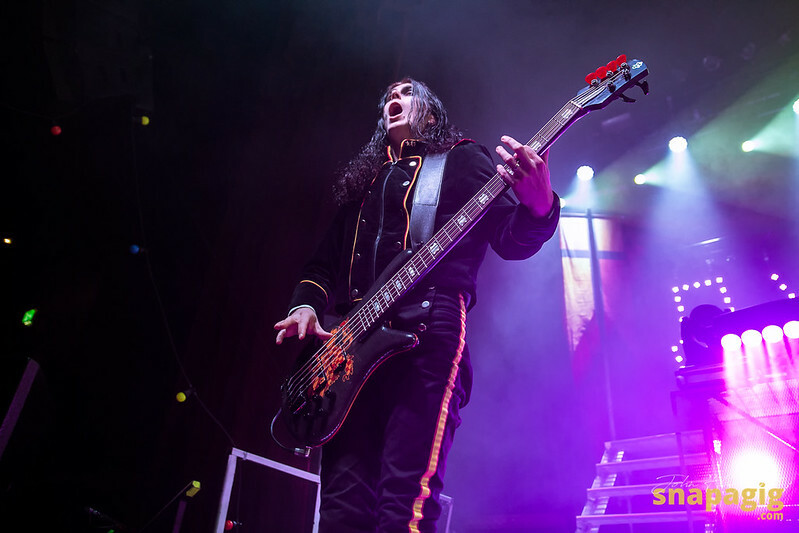 Returning to the stage for Encore – ‘The King Welcomes You’ and ‘Hail the Apocalypse’ this was an explosive start to the gig calendar for me and I hope it isn’t the last time Avatar play in these parts in 2019. Live on stage this band are fun to watch and bring entertainment as well as some great music, plenty of other bigger bands could learn a lot from this. 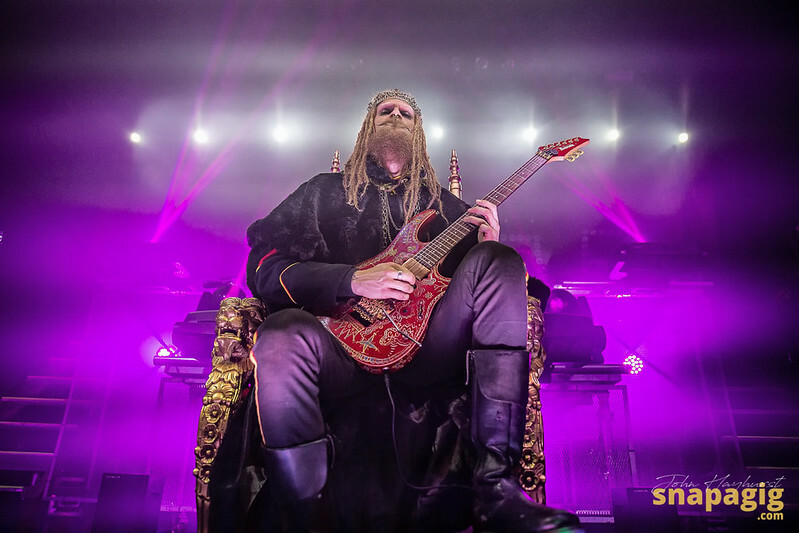 Their current album ‘Avatar Country’ is having 1 more trip around the world in 2019 before they look to their next opus (and possibly a crowdfunded film). The sold-out UK Tour is testament to their ever-growing attraction – but really, they should have been on bigger stages this time around.